Is it true that cats hate getting wet? I'd like to give my kittens a bath but I don't want to upset them. Hope you're having fun with your kittens! Yes, it's true that most cats hate getting wet. I certainly do! 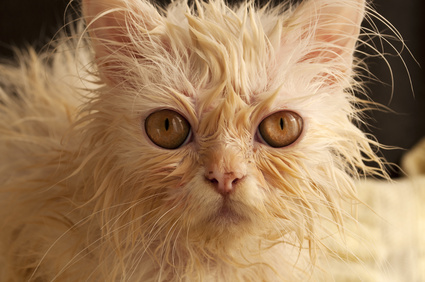 Wet fur makes us cold (think about how you feel when you first get out of the shower). And it slows us down because it weighs more when it's wet and soggy. Another reason cats hate getting wet it that wet fur makes us smell different. Heavy rain or a bath washes away all the familiar scents that we live with all the time, and that's very upsetting. Do your kittens really need a bath? All of us come with this great self-cleaning mechanism called filiform papillae (What the heck! Where did my human typist find that??). These tiny backward-facing barbs in the center of a cat's tongue help pull tangles out of our fur and remove dirt and loose hair. Even kittens are really good at bathing themselves and usually don't need humans dunking them in a tub full of water. Our human would be very, very sorry if she tried to give me a bath. But if you really must bathe your cats, this video by one of our favorite holistic vets will show you how. You can help your kittens stay clean by combing them often to get rid of the dirt and tangles their filiform papillae (Oh, how cool. I love using big words) miss. And when they get older, think about using unscented kitty wipes or dry shampoo if their fur is greasy and messy. They'll look and feel better without the trauma of getting soaking wet. Oops! Sorry, but I have to go now. I just noticed a speck of dirt on my left foot. Time to take a bath and put those filiform papillae to work!